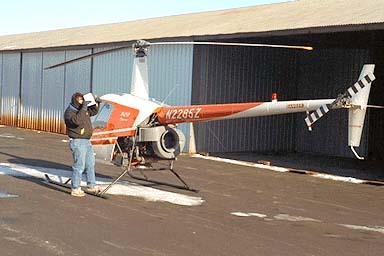 We have a single Robinson R22 up at the Lawrence airport. 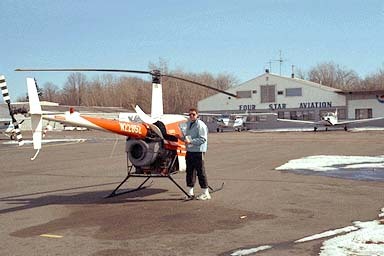 We mainly do training at this facility, and we rent office space out of Four Star Aviation. Four Star is a fixed wing FBO as well as being one of the two big Jet-A FBOs on field (i.e. they do a lot of biz jet fueling). They are also one of the friendlier FBOs I've ever been at. 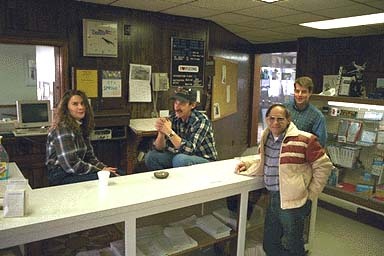 From left to right are Marilyn (runs the office on the week end) Bill (among other things drives the fuel truck), Bruce (a customer) and Dana (another All Star instructor). This is one of my students, Bruce (not the same Bruce as in the office picture) starting a preflight inside the (unheated) hangar at Lawrence. Note the machine on the floor to his left. The temperature this day was about -10C, so we had to preheat the helicopter. This consists of using the portable heater which burns kerosene and has a blower to force the hot air out some ducting. The ducting is pointed at the engine so that by the time we are finished with the preheat, the engine oil is warm enough to act as a proper lubricant. About 15 minutes later, the preheat is done, we've moved the helicopter out of the hangar (and into the wind!) 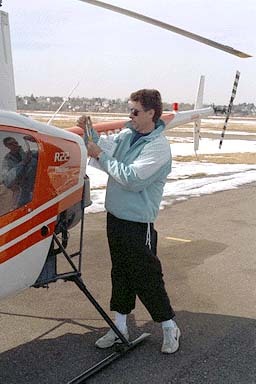 and Bruce is finishing up the preflight. Notice that Bruce is properly dressed for a New England winter preflight: a heavy coat with a high collar to keep out the wind, and heavy gloves. This is Gary, another student preflighting outside of the main Four Star building. This is a little warmer day, and Gary isn't dressed as warmly as Bruce was. In this next picture, Gary is checking the fuel for proper octane grade and possible contamination. 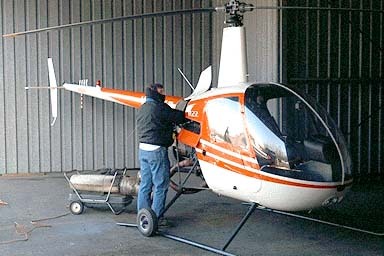 He has filled the little glass tube he is holding with fuel from the helicopter. If there is water or solids in the fuel, he will be able to see it. Also, because aviation fuel is color coded by octane, he can check that we have been fueled with 100LL (100 octane, low lead), which is blue. If the fuel was green, we'd know we'd been fueled with 100/130 octane (which is also okay in this helicopter). If it was red, the fuel would be 80/87 octane (which is not okay, because the octane is too low for this engine), and amber would indicate Jet-A, which would be really bad.